Crochet Braid Bracelet is an original PlanetJune Accessories crochet pattern by June Gilbank. 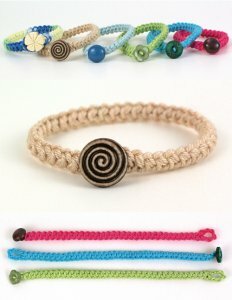 Crochet up a speedy braided bracelet with this decorative cord technique that's deceptively easy to crochet as it uses only single crochet stitches! Customize the length and look to match your own style or make a personalized gift. Simply change the yarn colour and button fastener to go from playful children's jewellery to a rugged man's bracelet, or from a beachy summer look to a fashion accessory in your favourite colour. Yarn: Yarn of your choice (I recommend a firm, smooth yarn like mercerized cotton in DK/light #3 yarn, or size 3 crochet thread, but you can experiment with different yarns to see what gives you a look you like). The quantity needed will vary depending on your yarn thickness, hook size, and bracelet length, but you'll typically only need 3-6m for one bracelet. Hook: An appropriate hook (see the yarn’s ball band as a starting point for the hook size, but you may wish to go up or down a couple of sizes to give different results). Sample bracelets used E US/3.5mm hooks and H/5mm hooks. This Crochet Braid Bracelet pattern is Donationware - the pattern is available to view online for free, but if you like it please consider sending me a donation to show your appreciation, and to receive the exclusive photo tutorial for the cord and the double-stranded bracelet instructions too (see below for details).